Did you know all of our sewing patterns are available in digital PDF format? That means you can buy a pattern and sew up a new dress in the very same day! In this blog post we’re going to guide you through how to assemble a PDF pattern so you get it right every time – and we’ll try to prove they’re not as scary as you think! PDF patterns are downloadable patterns which you can print at home on a normal domestic printer. You then assemble them together with glue or sellotape, and once that’s done you can use them as if they’re a normal tissue pattern. It’s magic really! The instructions come in a separate file so that you don’t have to print these if you don’t want to. We’re big fans of saving paper and helping the environment where we can, so we personally prefer to just read them off our laptops or iPads. 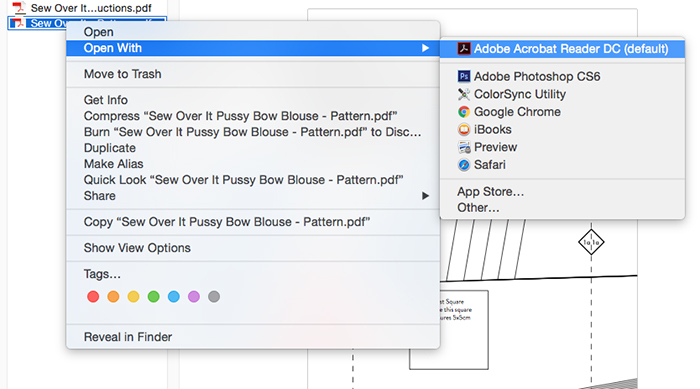 Saving and opening your PDF pattern correctly. 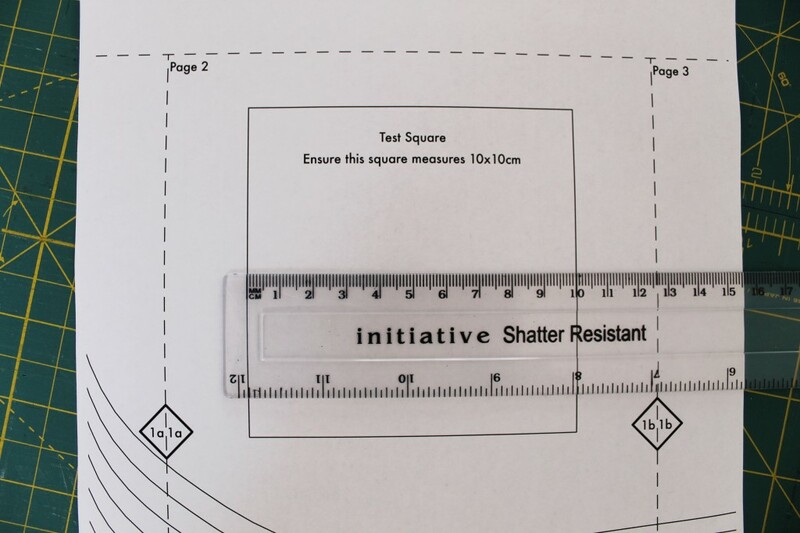 Once you have opened the file, you will find that the pattern has been broken down into A4 size pieces that can be printed out and stuck together. The most important thing to get right here is the scaling. So when you print you need to uncheck any “fit to page” boxes, or select “actual size”. Always uncheck “fit to page”. 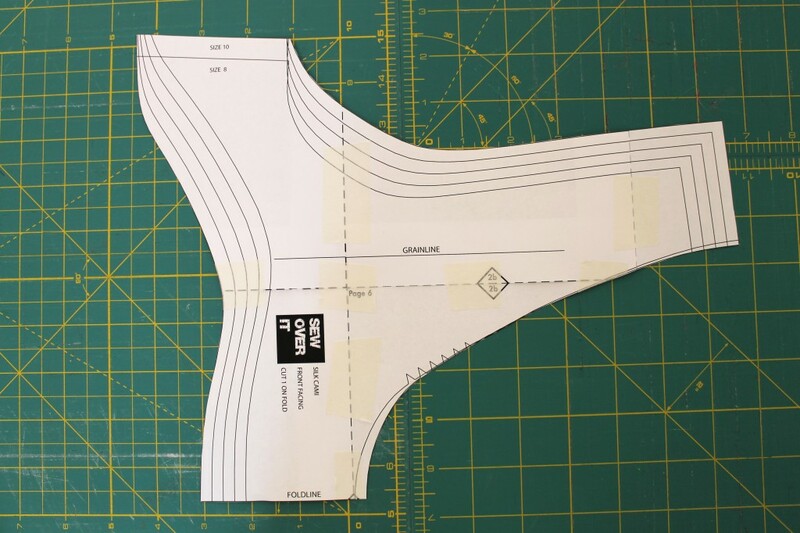 If you don’t do this your pattern will be printed at the wrong size, which will mean eventually the sizing will be wrong on your finished garment. 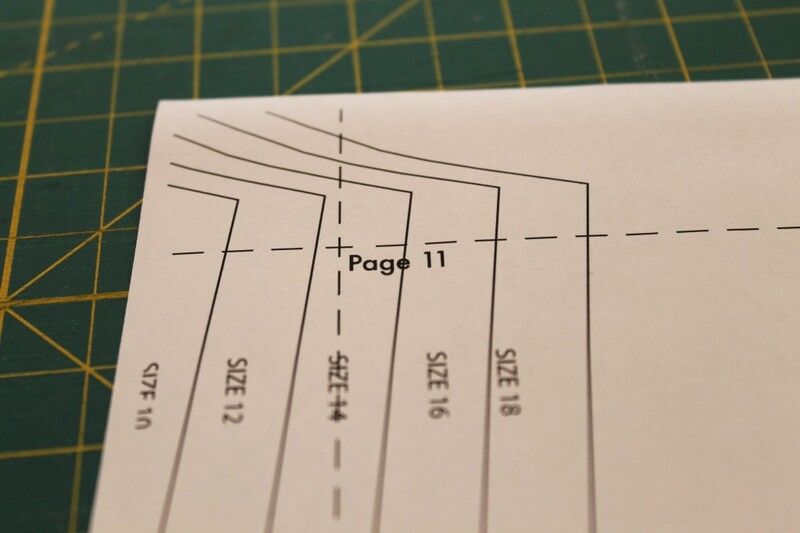 You can check you’re printing to the right scale by printing off the test page first – usually the first or second page of your pattern. The box needs to measure 10cm by 10cm. If it does, you’re good to print the rest of the pages. Once you have printed them out try to keep them in order as this will make your life a lot easier. In order to stick the pieces together you need to cut around the dotted line. To make things quicker, we like to cut off just the bottom and the right hand sides, and overlap the edges. This also makes lining the pieces up a lot easier. When it comes to sticking the pieces together, you can tell whether you’re matching up the correct pieces by following the numbered and lettered guides on each edge of the pattern. So 1a and 1a should match up, and 2c and 2c for example. 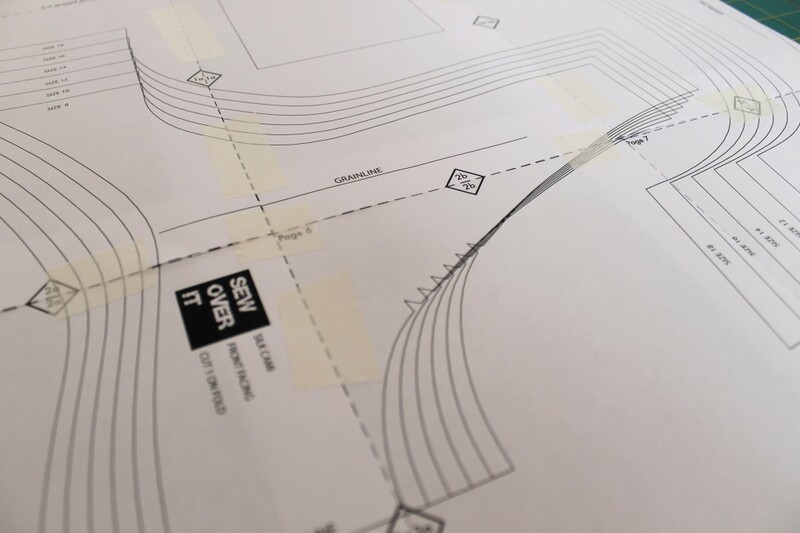 We purposefully haven’t removed the pattern markings from the margins for this reason – they help you line up the pattern accurately. 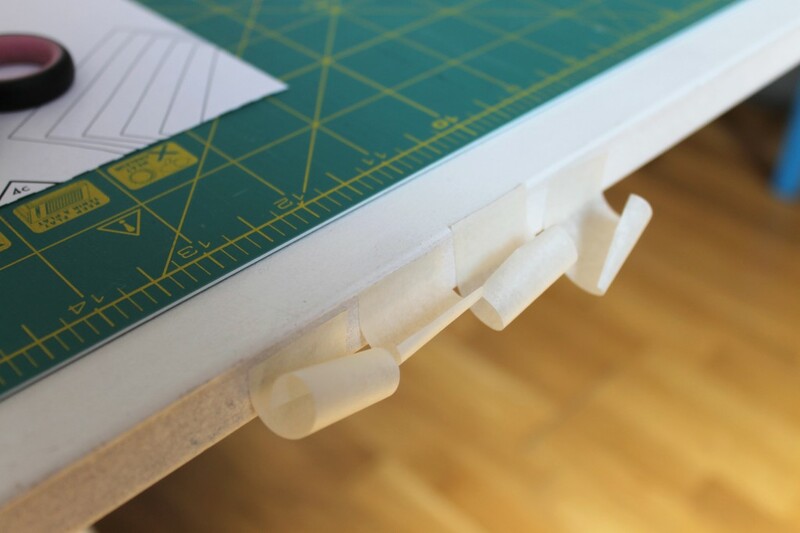 Top tip: you can use a glue stick to stick the pattern together, or you can use tape as we are doing. We like to cut a load of masking tape before we start sticking, it makes the whole process a lot quicker. Once you have stuck the pattern together, you can either trace it off onto a new sheet of paper, or you can just cut out your size and use the taped-together pattern as it is. Retape any bits that have come undone and then you’re ready to go! 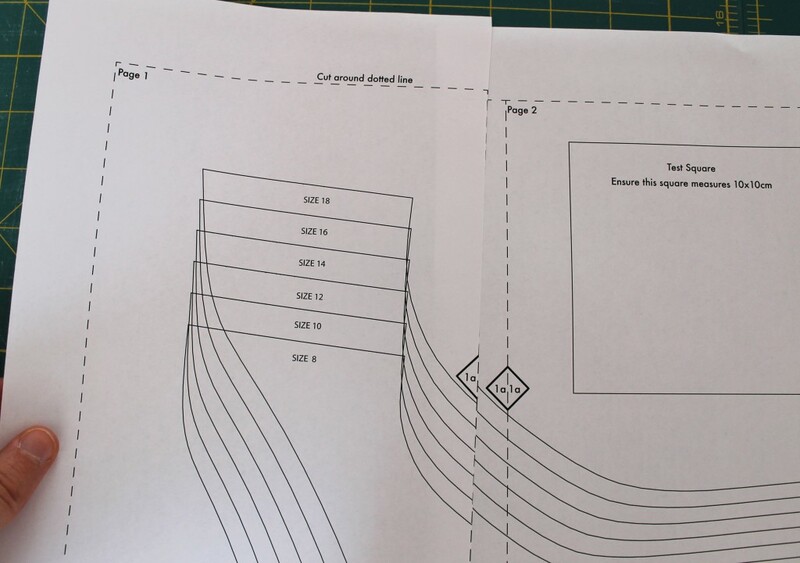 If you’re having trouble with how to assemble a PDF pattern don’t struggle alone! Leave us a comment below and we’ll get back to you as soon as we can. And when you’ve finished don’t forget to send us a picture of your finished garment! We’d love to see what you’ve been up to. 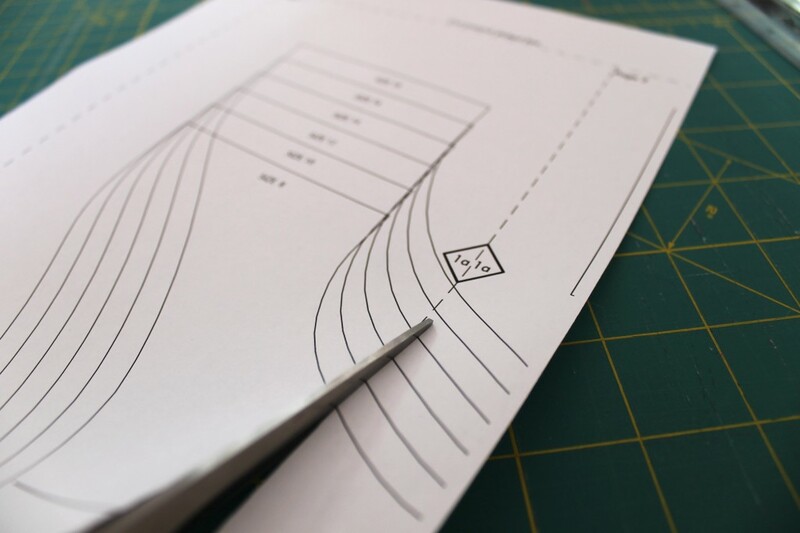 Want to save our guide on How To Assemble a PDF Pattern for later? Pin the image below to Pinterest and you’ll always be able to find it! I would like to try your patterns. Just wondering if they can be printed on 8 1/2 x 11 letter size paper? Or. Are the ptterns available in the US? It has been awhile I know but I wanted to answer this as I just had an issue with a printing a pattern. 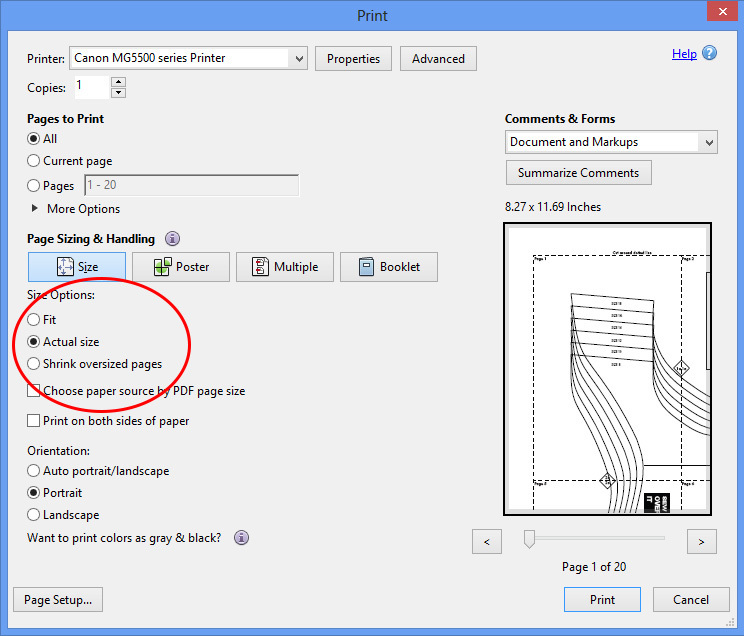 You do have to change your printer to A4, it will not print the proper size on Letter size setting. Make sure you check the sizing test box before printing. I checked all the boxes as said and then printed. 33 pages later I discovered it printed the wrong size because it was on letter size setting. I didn’t realize there was a difference. Regards from a Canadian customer. Hi, I’m having problems printing 🙁 I’ve opened the pattern in adobe, I’ve ticked the actual size box but it only prints one small section. It doesn’t seem to break the whole file down into multiple pages, it only prints one small section. What am I doing wrong? Help! Hi Alice, it sounds like you might be trying to print the copyshop file? Make sure you’re printing the A4 pattern file. If that doesn’t solve the problem just drop us an email with a screenshot and photo of your print-out and we’ll do our best to help! Same question as Sarah, can your patterns be printed on 8.5×11 inch paper? I don’t understand how to get the folder to the copy shop, I am presuming it’s via email but don’t know how to do this, can you advise me please? I’d like to print the instructions as a booklet but no matter what paper (A4 or A5) I use, the pages don’t come out full size on the page. presumably I put the shop copy file on a USB and give to the shop. How much does it usually cost to print and do you know anyone in the Islington area who is use to printing such documents? I’ve been comparing local copy shops (in Canada) and came back here because I remembered seeing the cost listed here. Out of curiosity I checked the link above and I see their price has doubled since last June!! It’s now 1 pound 50. That’s still cheaper than every quote I’ve heard here so far. Hi there, is the seam allowance included within the pattern or do you need to add on the extra 1.5cm? 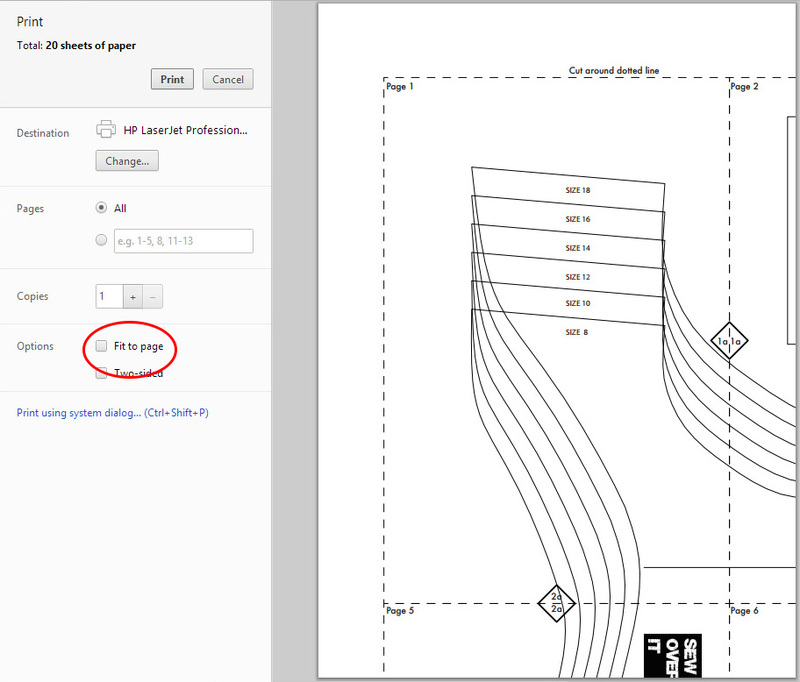 I am trying to print Ava skirt on letter size paper 8.5×11 using the US letter pattern through Adobe. Printing at 100% actual fit and bottom cut line does not print. The test box is good. Help!